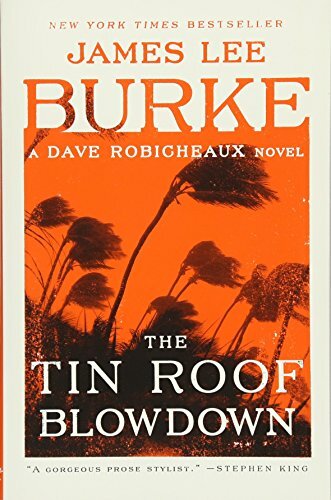 Dave Robicheaux returns in an adventure as timely as real life: the fight against crime, and the fight for life in New Orleans in the aftermath of Hurricane Katrina. In the waning days of summer 2005, a storm with greater impact than the bomb that struck Hiroshima peels the face off southern Louisiana. This is the gruesome reality Iberia Parish Sheriff’s Detective Dave Robicheaux discovers as he is deployed to New Orleans. As The Tin Roof Blowdown begins, Hurricane Katrina has left the commercial district and residential neighborhoods awash with looters and predators of every stripe. The power grid of the city has been destroyed; New Orleans reduced to the level of a medieval society. There is no law, no order, no sanctuary for the infirm, the helpless, and the innocent. Bodies float in the streets and lie impaled on the branches of flooded trees. In the midst of an apocalyptical nightmare, Robicheaux must find two serial rapists, a morphine-addicted priest, and a vigilante who may be more dangerous than the criminals looting the city.